When the Xbox Live Gold Family plan hits Xbox Live this November, you may not have to pay a penny to sign up, depending on how many existing paid accounts you have. The Family plan includes four one-year Xbox Live gold memberships for $100. Currently, one-year gold memberships run about $50 a pop. So how, I asked Jerret West, senior group product manager of Xbox Live subscriptions, is Microsoft going to do the math on people rolling their individual plans into the family plan? "Solving for something like that was like solving for the matrix," West said. "You will be able to migrate your core accounts over and pick up credit for those." West said that Microsoft will look at the value of the remaining time you have left on the total number of accounts you are rolling over into the Family plan and then give you the appropriate amount of credit towards the $99 sign-up fee. If the accounts you are rolling into the plan have more credit than the $99 it costs to start the plan, Microsoft will extend your membership for the appropriate number of months. 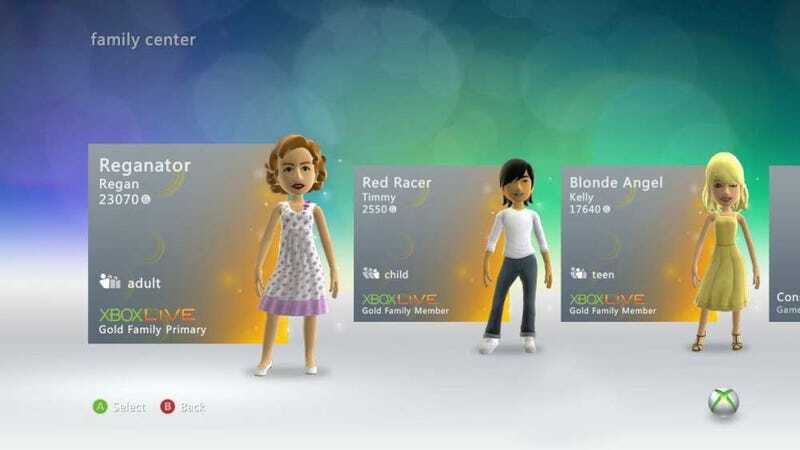 While the four gold accounts have to be created on the same Xbox 360, they don't have to stay on the same Xbox 360, West confirmed. The one draw back to this is that even if those accounts are spread to multiple consoles, all of their charges will still go to a single credit card. Though it seems to me that if you create a master account, you could just lock off the ability to purchase on those three accounts... or, if you're annoyed, prevent them from playing mature games. OK, so maybe not the best plan for a frat house. I also asked West if there were any thoughts of allowing households with more than four gold accounts to join the family plan for a set fee per an account, like maybe charging an extra $20 or $30 for every account over the four included in the plan. "Four is the magic number right now," West said. "But that's on the table. We want to see how this works out first though."